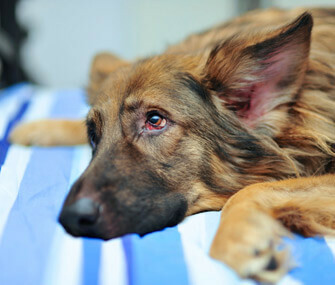 Pancreatic insufficiency is particularly common in German Shepherds. Typical symptoms include severe weight loss, ravenous appetite, runny/watery stools, skittishness or aggressive behaviour, hair loss and a lack lustre look in the eyes. In dealing with pancreatitis, we would suggest changing your diet to a completely natural, wholesome and high moisture diet. Any of Vondi’s Holistic Pet Nutrition variants would be appropriate. The Vondi’s Vegan Diet is high moisture, low-carb meal that would also we extremely beneficial in treat this disorder. Importantly, and supplementing to this diet, we would suggest Pig’s Pancreas, available at many butchers. This has proven to be very effective and a “life saviour”. Typically you would mix 25% of the normal feed with pigs pancreas. In other words, if you were feeding 500gr of Vondi’s, you would include 100 – 125gr of Pig’s Pancreas, daily. You should note improvement very soon, an increase in weight, better stools, glossy coats and just improved well being. This is an on-going treatment and even when your dog’s weight is at its optimum, you should continue with this regimented diet. However, thereafter you can reduce the inclusion of Pig’s Pancreas to 10%. Furthermore and to increase immunity, we would recommend the inclusion of the following supplements – spirulina, apple cider vinegar, omega 3 fish oil and a good probiotic (optional). Please refrain from using flea poisons and/or bathing your dog using chemical based shampoos. This will certainly reduce immunity. Dr Malan van Zyl, a Specialist Veterinary Physician at Cape Animal Medical Centre (021)686-6610 also endorses the use of pig’s pancreas as part of the treatment for exocrine pancreatic insufficiency following diagnostic confirmation.